The perfect way to set off any occasion, from garden parties to weddings. 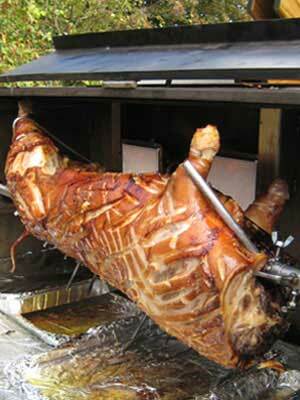 There is no mistaking the taste of a traditional hog roast with lashings of stuffing & apple sauce and no denying the sight of a spit roasted hog is a great way to impress friends and family. Our Water Hog Hog Roast ovens are driven by large water wheels, the gentle trickle of water slowly turning the spit while the hogs roast to perfection. Not only perfectly functional, the water wheels are an added visual spectacle to pique your guests interest while the aroma of the hog roast tantalizes their olfactory senses. With our two water wheel driven hog roasters we can feed anything from 40 to 240 people with prices starting from £5 per head. 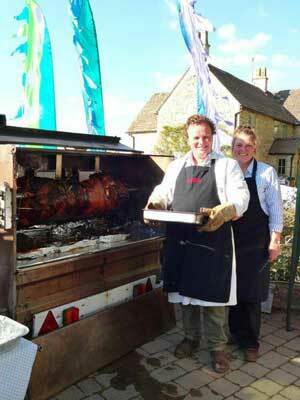 Our fully catered service will take care of setting up, cooking & carving a home produced hog, (or lamb) leaving you to enjoy the aroma, mingle with your guests and work up an appetite for a delicious local bakery roll, filled with succulent pork and lashings of stuffing & home made apple sauce. We set up a 3m x 3m gazebo. Our serving tables are laid with white linen cloths, heated dishes, napkins and sauces. 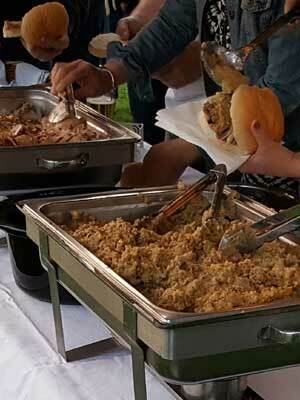 As the hog is ready for serving, we willl take care of carving and serving guests from from the serving station. Small Party? Small Space? Small Budget? We may still be able to accomodate your needs. 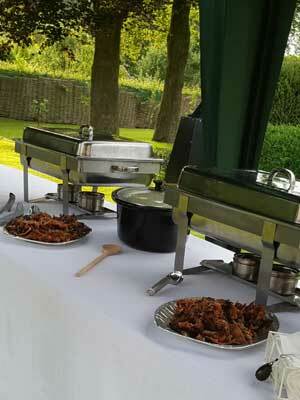 Why not ask about our Pulled Pork option with home made BBQ sauce and coleslaw? 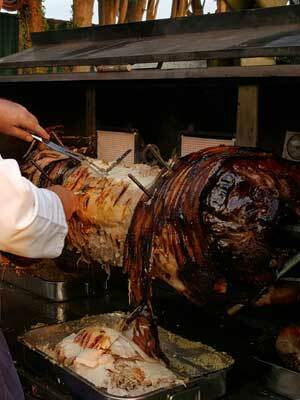 Or the Hog Roast experience, without the roaster? Perfect for smaller parties or venues limited on space. Contact us to discuss your requirements, Water Hog availability, and prices. Please bear in mind that access for a vehicle and trailer, and to electricity and water, will be required. New for the Summer 2017, meet The Beast! Our new giant gas BBQ griddle. For those looking for BBQ catering for events or parties The Beast is capable of catering for higher numbers than you common or garden BBQ. 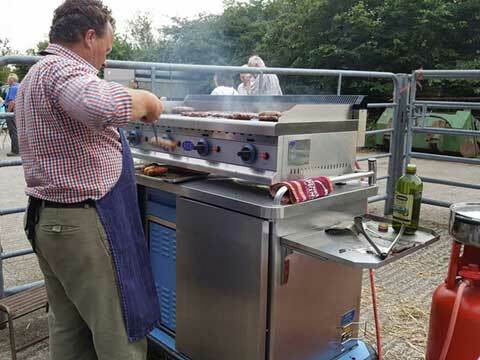 With all the convenience of cooking on gas combined with a much smaller footprint than the Water Hog, The Beast gives you the ability to provide our top quality home produced Hawkesbury Farm Shop produce to you guests. The menu can be tailored to suit your needs. 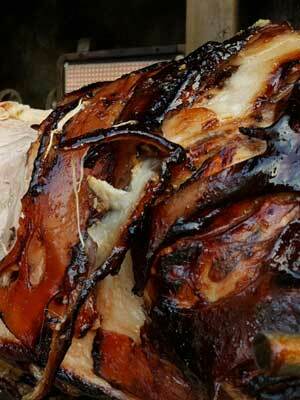 Browse the full range of BBQ goodies available from Hawkesbury Farm Shop for inspiration. 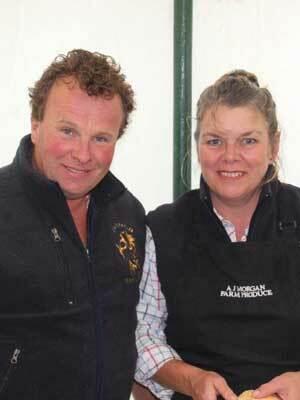 Contact Karen on 07929-947149 to discuss your requirements, Water Hog or The Beast's availability, and prices.